If you have been snorkeling for a while and have used various snorkel gear, one of the problems you may be aware of is poor underwater vision clarity. People with eyesight problems that wear contact lenses or prescription eyeglasses may not think snorkeling is for them. However, nothing can be further from the truth. Today, companies have come up with various snorkel masks with prescription magnification for people with poor vision. These prescription snorkel masks are specifically designed to improve underwater visibility of snorkel lovers with poor eyesight. Prescription masks are available in different corrective grades. The grades will determine which mask will be suitable for your eye condition. Should You Buy Prescription Snorkel Masks? There are a number of differences between prescription dive masks and regular snorkel goggles. The unique designs of the masks appeals to different people. If you have sight problems such as myopia, you will benefit from using prescription snorkel goggles. Prescription masks typically come with dual lenses. The lenses correct your vision when you are underwater. Before buying a snorkel prescription mask, make sure it does not hang too loosely nor fit your head too snugly. The mask should also have some kind of sealing to prevent water from leaking it. Finally, choose a mask made by a well-known brand. You should read prescription snorkel reviews to know what to expect of different equipment you may be interested in buying. 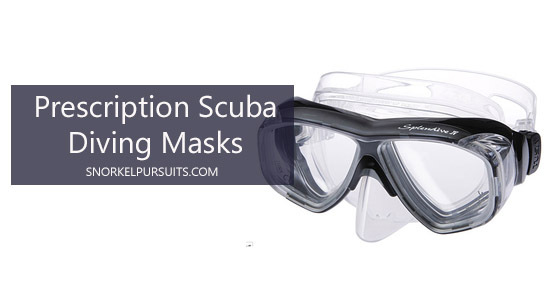 Read our reviews of the best prescription snorkel masks in the market. 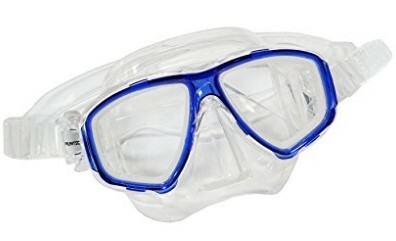 The Scuba Choice Nearsighted Prescription mask is an inexpensive option for beginner snorkeling enthusiasts with poor eyesight. The snorkel lens options range from -1.5 to -10.0 and are available in increments of 0.5. The lenses are made of tempered glass and silicone. They also have a buckle design and an adjustable strap that makes them fit any head shape. The Scuba Choice prescription mask has many positive reviews on Amazon. However, like many cheap snorkel masks, they get a little foggy underwater. If you will be using the masks, you will need some form of anti-fog treatment on the lenses. Given the cheap price of the snorkel mask, it offers value for money. This is one of the best snorkel masks for beginners and intermediates looking for cheap equipment. The snorkel mask belt is easy to adjust and their build quality is great for the price. The mask fits comfortably underwater and offers superior vision quality. 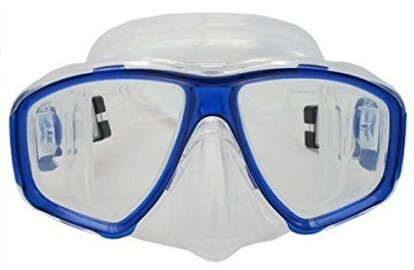 If you are looking for an alternative prescription dive mask for beginners, consider the IST Prescription Snorkel Mask. This mask is comparable to the Scuba Choice in terms of pricing. From Amazon reviews, many people are happy with the performance and quality of the mask. However, some people are critical of it for not having different corrective lens options. The IST snorkeling mask is functional, rustic and provides good value for money. However, given its cheap price, do not expect a lot from it. We recommend the mask for anyone looking for a budget prescription mask or snorkel beginners. One of the downsides of the IST prescription mask is that it tends to run on the snug side. If you have a large head, you are likely to experience tension headaches if you wear the mask too snugly for a long time underwater. Moreover, the mask may be a bit small for people with large heads. Generally, IST snorkel mask is a good option for beginners with vision problems such as farsightedness, nearsightedness and others. The snorkel mask will enable you see better underwater than conventional scuba masks. If you are an intermediate snorkeler or would like a mask with a wider range of features, consider going for a higher end mask. The Promate Optical Corrective snorkel mask is an impressive mid-range underwater gear. The affordable prescription mask comes with different varieties of corrective lens options that range from -1.0 to -10.0, +1.0 to +40, and bifocal lenses that range from +1.0 to +4.0. The lenses come in 0.5 increments. 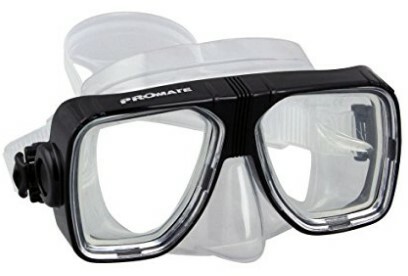 If you are looking for an affordable corrective snorkel mask for your specific prescription, consider this Promate snorkel. The mask has a comfortable silicone seal and tempered glass with a low internal volume. You can also configure the mask to match your requirements. You will not feel uncomfortable wearing the Promate Optical Corrective mask over extended snorkeling sessions. This mid-range snorkel mask is a good alternative for the IST. The snorkel mask is lightweight, provides excellent visibility underwater and stands out for its high-performance corrective configurations, which works for anyone struggling to find the right prescription. The Promate is a cost-effective prescription mask that delivers great results. However, if you have a small head, the mask may be a bit loose. One of the high-end prescription snorkel masks you can buy is the Promate Prescription Purge Mask and Dry Snorkel Set. Like the name suggests, the equipment features a purge mask and high-end dry snorkel combined in one deal. This is an expensive prescription mask. However, its features make it one of the best prescription snorkeling gear for experienced and intermediate underwater adventurers with vision problems. The snorkel mask is comfortable and comes with various prescription lenses. The clarity provided by the lenses cannot be matched by cheap prescription masks. The mask has a purge feature that efficiently removes excess water and the lenses do not get foggy. The masks also fit the head just right i.e. they are neither loose nor do they fit too snugly. The Promate prescription mask has an adjustable strap and hence can perfectly fit any head shape or size. The price of this quality prescription dive mask is certainly worth it. If you usually have a problem seeing objects under the water up close, you need the Scuba Choice Farsighted Prescription Mask. 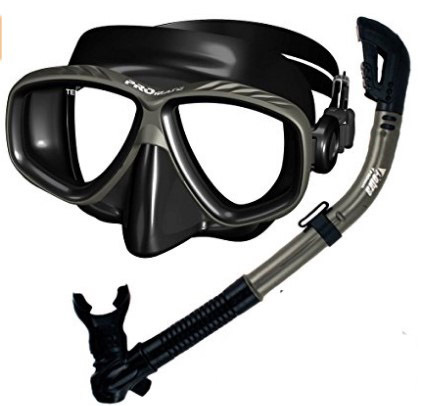 This mid-range scuba mask offers excellent value for the price point. It also has a sealed silicone skirt and adjustable buckle and is comfortable to wear even over extended scuba sessions. Finally, the prescription mask is affordable. The Scuba Choice mask is specifically designed for underwater adventurers that have varying degrees of farsightedness. The mask comes in grades +1.0, +1.5, +2.0, +2.5 and +3.0. Wearing the mask results in an immediate difference of vision of people with farsightedness. Majority of Scuba Choice prescription mask reviews on Amazon are positive. The mid-range snorkel mask is a great option for both beginners and intermediate scuba divers looking for corrective lenses for better underwater visibility. Most people with vision conditions find snorkeling quite a challenge. However, using the above prescription will ensure they enjoy a wonderful underwater adventure without being restricted by poor vision.